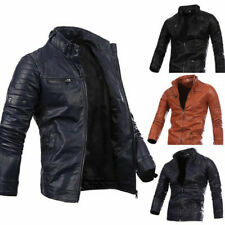 Mens River Island Leather Biker Jacket Size M. Brand new with tags. Please check pictures for measurements. 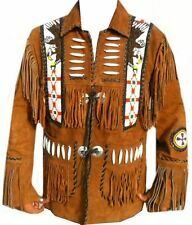 Men's Quality coat from Hud. Colour is black Material is leather. Style is coat or jacket. Label size is Medium Pit to pit = 24 1/2" Length at rear = 32 1/2" Sleeve = 16 1/2" (All measurements in Imperial inches.) In very good used condition, 10/10 Please see photos for condition and measurements. Nuevo anuncioPara Hombre de Colección Chaqueta Burton Cuero marrón Grandes Forro de mapa de EE. UU. 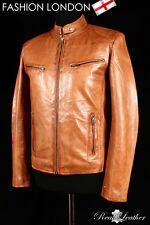 Mens Vintage Burton Brown Leather Jacket. • Size: Large. • Lining features a map of the United States. •Zip and poppers front fastening. •Four outer pockets and one inner. •Elasticated Waist at both sides. The jacket has a few scuffs but this adds to the character. •Approx Measurements: Length: Shoulder to hem 26”. Width: Underarm across 22.5”. Sleeve length: Underside seam 19”. Jacket has been in the loft so may need a dry clean before wearing. Made in USA. The zip and popper buttons work fine and the lining is ok with just a little missing thread from the quilted diamond pattern. Would benefit from a clean to freshen it up. Shoulder to cuff - 24 1/2. 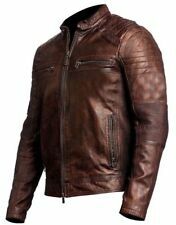 Men's GREENWOODS leather jacket. Colour is very dark brown Material is leather. Style is bomber jacket. Label size is L (large) Pit to pit = 25" Length at rear = 29" Sleeve = 18" (All measurements in Imperial inches.) In great condition. 10/10 Please see photos for condition and measurements.